Lectins are useful reagents for the structural characterization of glycans. 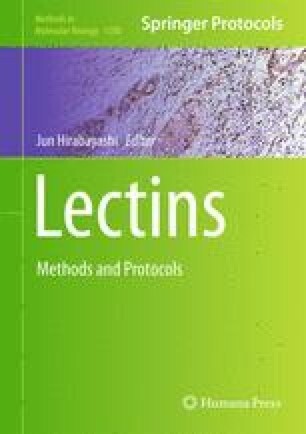 However, currently available lectins have an apparent drawback in their “repertoire,” lacking some critical probes, such as those for sulfated glycans. Thus, engineering lectins with novel specificity would be of great practical value. Here, we describe a directed evolution strategy to tailor novel lectins for novel specificity or biological functions. Our strategy uses a reinforced ribosome display-based selection combined with error-prone PCR to isolate mutants with target specificity and an evanescent-field fluorescence-assisted glycoconjugate microarray to rapidly evaluate the specificity of selected mutants. A successful case of screening a lectin, which has acquired an ability to recognize 6-sulfo-galactose-terminated glycans, is described.